I suppose one shouldn't tinker with a traditional South African recipe that has such a long and noble pedigree, but I thought I'd introduce some zing and freshness to my pickled fish this Easter. 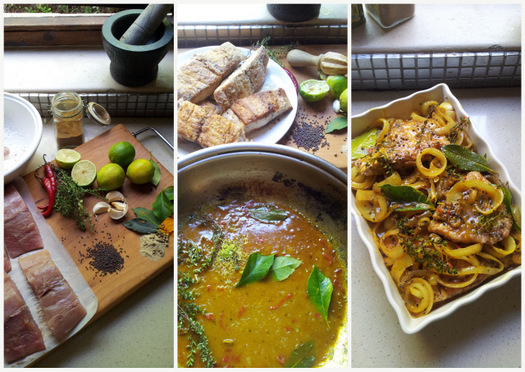 I've given my 2010 recipe for Extra-Lemony Cape-Malay-Style Pickled Fish a kick in the pants with fresh lime juice, lemon thyme and plenty of white pepper, and I'm pleased with the result. Thickly sliced onions add punch and crunch to my lighter version of pickled fish. 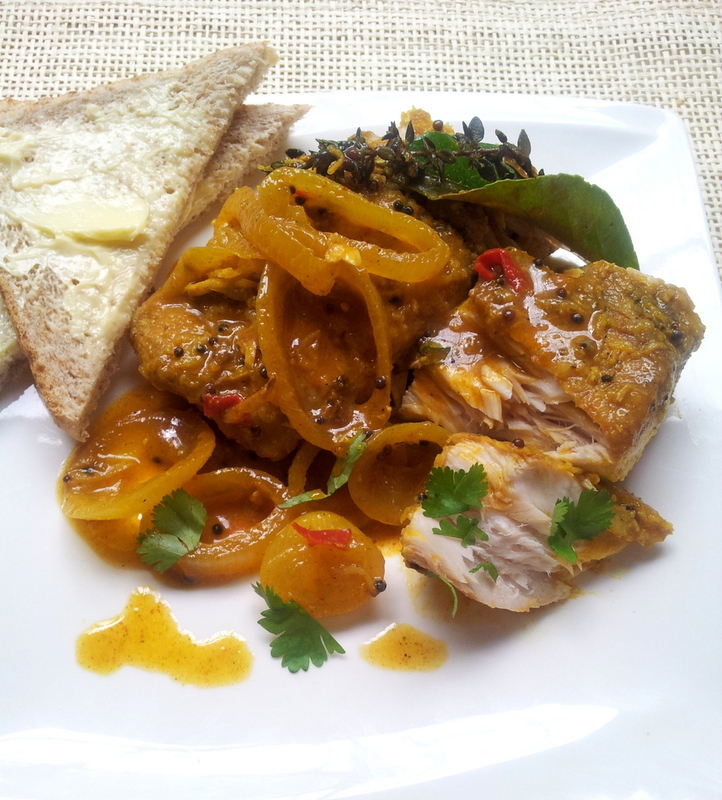 Pickled fish is lovely with buttered brown bread. The next time I make this (this week, hopefully, in time for the Easter weekend) I'm going to try using only Thai flavours for the marinade, because I think a sweet-sour-salty-hot pickle with plenty of fresh coriander, lemon grass and green chilli may be an irresistible combination. 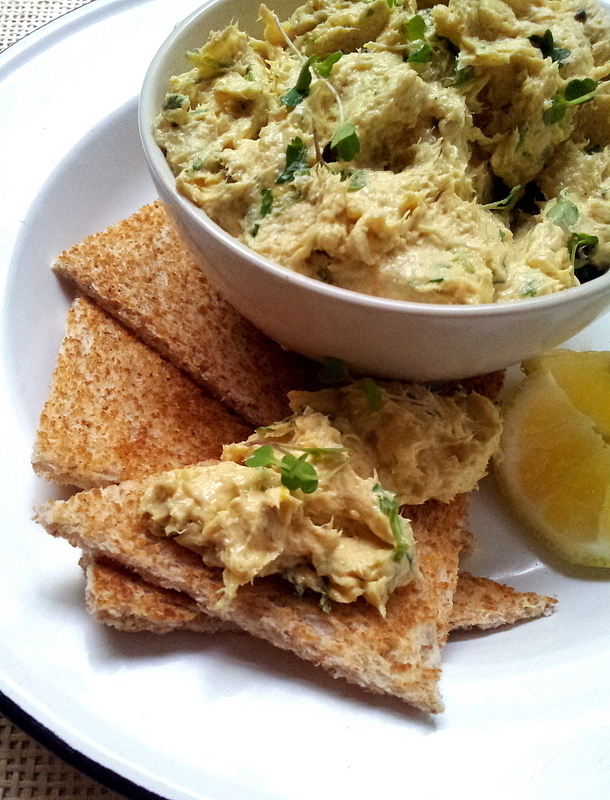 Further down in this post, you'll also find a recipe for a deliciously buttery, mildly spiced dip using pickled-fish left-overs: I made a few pots of this paté this week, using the leftovers no-one in my family wanted, and it was eagerly devoured by my guests on Saturday night. lovely citrussy flavour, and I've added mustard seeds for extra bite. 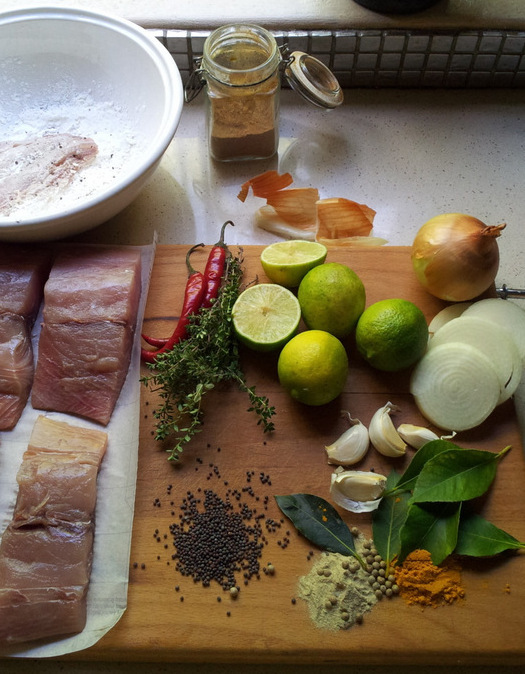 I still can't figure out, three years after I wrote about South African pickled fish on this blog, how this old recipe has come to be associated with Easter in Cape Town. One of my Facebook friends, Helen Brain, advanced her theory: 'I suspect that it has to do with Good Friday church services, which take three hours. You don't have time to cook after that, so pickling the fish means that when you come home from church at 12, lunch is ready.' That seems plausible, but it still doesn't explain how this dish, indisputably a classic of Cape-Malay cuisine, is so eagerly looked forward to by Islamic families in the Cape during the Christian holidays of Eastertide. If you have any insights or inklings about this, please post them in a comment below! Don't slice the onions too finely, or fry them too long - they should retain a good crunch. In this recipe, the ginger and garlic are very briefly cooked, as are the other spices, so that the pickling liquid is fresh and zesty. 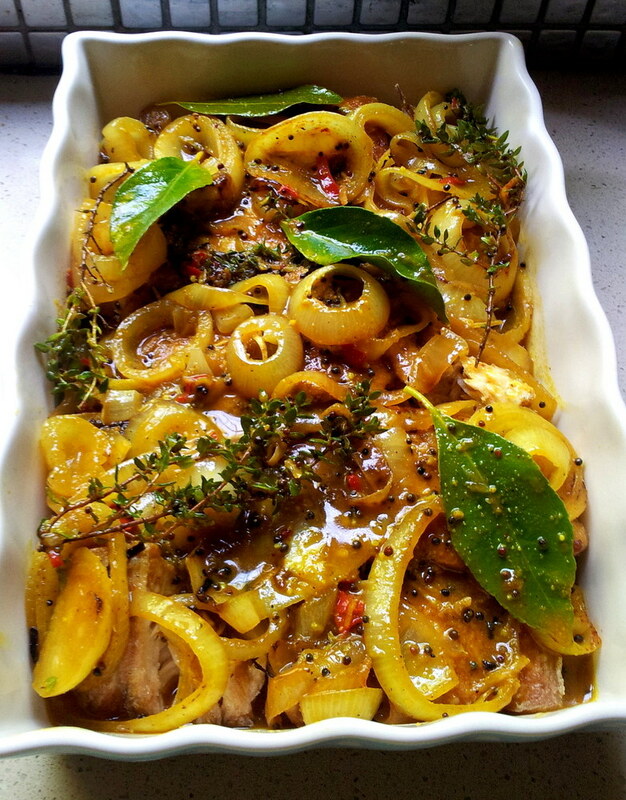 If you can't find lemon thyme, use some roughly chopped lemon grass instead. Cut the fish into portions each about the size of a deck of cards. Put the cornflour on a plate and season with salt and a little white pepper. Press the fish pieces into the cornflour, top and bottom, then shake them energetically to remove the excess. Heat the 3 Tbsp of oil in a pan over a medium-high heat, and when it is good and hot, fry the fish pieces, in batches, for 2-3 minutes on each side (depending on how thick the pieces are) or until golden brown and just cooked through. Take care not to over-cook the fish, or it will dry out. Remove from the heat and set aside on a plate. Now make the pickling mixture. Wipe the pan clean of oil and residue using a piece of kitchen paper. Heat 2 Tbsp of sunflower or canola oil in the pan, over a medium-high flame. When the oil's hot, add the onion rings, and fry, stirring now and then, for 2 minutes, but no longer (it's important that the onions retain their crunch). Stir in the garlic and ginger and cook for another minute, without letting the garlic brown. Scrape the onions, garlic and ginger into a bowl and set aside. Heat the remaining tablespoon of oil over a medium-high heat in the same pan and add the mustard seeds, peppercorns, cardamom pods and red chilli [optional]. When the mustard seeds begin to crackle, add the bay leaves, sugar and vinegar. Bring to the boil, then stir in the turmeric, white pepper, cumin, curry powder, salt and half a cup (125 ml) water. Cook the mixture for 2-3 minutes at an energetic bubble, or it has thickened slightly and the strong vinegar flavour has dissipated. Stir in the lime juice and zest, the lemon thyme sprigs, the remaining half-cup (125 ml) of water and the reserved onion/garlic/ginger mixture. Simmer gently for another minute and then remove from the heat. Tip half of this mixture into the bottom of a ceramic or plastic dish just big enough to hold all the fish in a single layer. Pour the remaining mixture on top, making sure every piece of fish is well coated with the pickling liquid. Top with a few extra sprigs of lemon thyme, plus some fresh lemon leaves, if you can find these. Cover the dish tightly with clingfilm or a lid, and refrigerate for at least 12 hours - preferably 24 - turning the fish now and then in its pickle. Serve cold, with buttered brown bread, and perhaps some cold crunchy salads, or warm boiled potatoes. This mixture keeps well in the fridge for up to a week. And here's what to make with the leftovers. If you don't have a small jug attachment for your stick blender, you can pound everything together to a paste using a mortar and pestle, or use a food processor fitted with a metal blade (although you might need to double the quantities if your food processor is a big one). Make sure you've removed every bone and scrap of skin from the flaked fish. Put the fish into the jug attachment of a stick blender, or into a liquidiser. Add the onion rings, pickling liquid, olive oil, lemon juice and Tabasco sauce, and whizz the mixture to a fairly homogenous yet slightly chunky paste. If the mixture is too thick for the blades to turn freely, add a little more of the pickling liquid, or some water. Now add the coriander leaves and press the pulse button a few times so the leaves are fairly coarsely chopped through the mixture,but not pulverized (which will turn the paste green). Season to taste with salt and pepper, and add a little more lemon and Tabasco sauce if the mixture needs a little more sparkle. Scrape into a bowl, cover with clingfilm and refrigerate for an hour or two, until just firm. Serve with hot toast or crackers. I liek the sound of using lemon leaves as a flavouring. Maybe I could try them instead of lime leaves in thai recipes? Pickled fish doesn't really appeal to me and I am very sure my family wouldn't eat it, so I'm not going to embrace Cape tradition on this one.... will stick with the hot cross buns on Friday! Never used lemon leaves.....What is the taste?